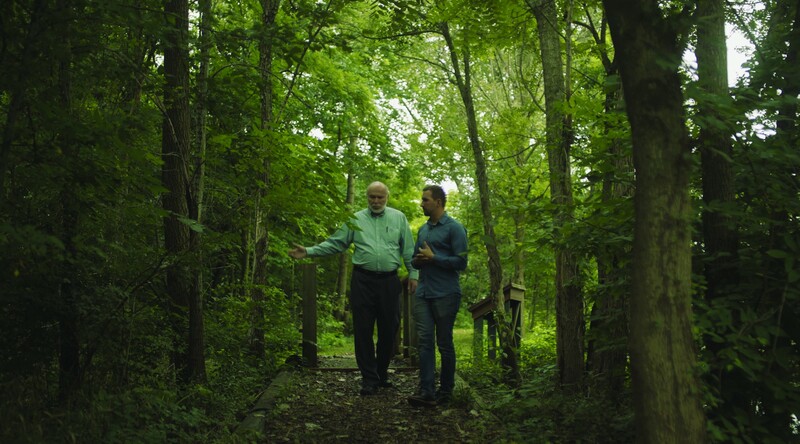 The story of the time, talent, and treasure behind the Elkhart Environmental Center. It’s 6:00 a.m. and Jamison Czarnecki is swapping his orange and grey running shoes for a pair of well-worn hiking boots. He’s on his feet the bulk of the day, and much of that is spent outdoors. Red laces offer just the slightest touch of flare to an otherwise reserved appearance. Jamison heads out the door, and he’s off to work. He passes the familiar Emilio’s Tires and crosses Main Street. Johnson Controls to his right and industrial buildings to the left form a final barrier before he hits the final stretch of road that will bring him to his sanctuary. This area of southeastern Elkhart isn’t the prettiest. In fact, you’d never know what hides beneath the surface of Lusher Avenue had you not been introduced to it by a program likely shared by Jamison and his staff. Jamison drives the last half mile through a tunnel of turning trees. The pathway explodes with vibrant autumn colors, and you can practically taste the apple cider and cinnamon donuts in the air. Yellow birch leaves paint the road, and a canopy of oak and maple hangs overhead. A slight bend to the right and a beautiful log cabin emerges in an open pasture. It’s a scene from a storybook. The inside of the cabin is brilliantly lit, both by natural and LED lights. The common area is simple and beautiful. The walls show pictures of progress over the decades. A table across from the doorway hosts a digital donation tool, allowing visitors to give with a single swipe by credit card. A wide, beautiful hall opens into a gathering space. Chairs and tables are empty, waiting for the day’s first busload of eager elementary kids. Today, Beardsley Elementary will make the trip across Elkhart to spend the day at the center. Mrs. Williams and Mr. Dowiat will bring their fourth-grade classes through those doors in just an hour, and there is much preparation to do. Jamison is soft-spoken but energetic. Short and built like a cross-country runner, his passion for the environment courses palpably through his veins. He has never thought of himself as a teacher, but sometimes life puts you in positions that make more sense than you’ll ever understand. Jamison was once a student, sitting at tables not very different from these, listening to someone in his current shoes. He remembers it fondly. He had always loved the outdoors, but the Elkhart Environmental Center turned his unfocused love as a student into a powerful life passion. Conservation, recycling, and protecting an environment that you depend upon weren’t questions of politics or even of science for Jamison. The environment ought to be protected because it provides everyone with sustenance and life. Jamison’s time spent here as a youth was formative, and he’s happy to bring his experience full circle, exciting the next generation of conservationists. Today, he’ll work with over 100 school kids. He’ll walk them through the center, show them the history of the grounds. He’ll hear the gasps and see the shock on their faces when he talks about the history of the site. He’ll walk them through trails, introduce them to wildlife and plant life. And today is just one day. Over the year, he’ll reach thousands with his message, and the center will impact even more through programs around the community. Jamison finishes setting the tables with a get-to-know-you project just as the squeak of old brakes gives way to the subtle blast of release air lines. The buses are here. He loves this work and he feels truly connected to this place. The Elkhart Environmental Center is set on 66 acres at the eastern end of Lusher Avenue. The area is part of a 120-acre greenway river system lush with greenery and fertile with growth. The Center’s lands house five man-made wetlands. The wetlands provide a natural habitat for animals and waterfowl in the area. Open prairies, large grassy areas, and fields of wildflowers offer buffer between water zones, and a forest area provides a natural buffer before the Elkhart River. Educational art sculptures dot the green land with bits of beautiful rust and metal. The flagship structure is that gorgeous log-cabin style meeting center. Trails are carved and maintained about the property. The land looks more like it belongs in Yellowstone — with its cabin serving as Elkhart’s own mini Viking Hall — than it does in a park in Elkhart, Indiana. That sentiment is only magnified when you learn its history. Beginning in the spring of 1959 and for the decades after, for only 25 cents, you could dump virtually anything at the end of Lusher. It wasn’t unusual for the fire department to be called to extinguish blazes that popped up from the chemicals and trash tossed here. Like oily rags in a can, the place had an awful tendency to spontaneously combust. After 20 years that saw the dumping of hazardous waste, heavy metals, and literally tons of trash, the state ordered the dump to be closed without any path forward. The trash spent the next 15 years rusting, oozing, combusting into balls of fire, and decaying into the earth below. Famous last words. Gary was a force to be reckoned with. Gary moved in quickly with a plan he knew would take time. He used a peculiar phrase to talk about human capital. Gary refers to everyone as having a balance of time, talent, and treasure. Well, the Lusher project was about to take a hefty chunk of his time and talent. By this time, the dump had taken on something of a second life. Squatters and pickers had created what looked like a post-apocalyptic town. Currency flowed in rusty iron and crushed tin. But Gary wasn’t to be stopped. 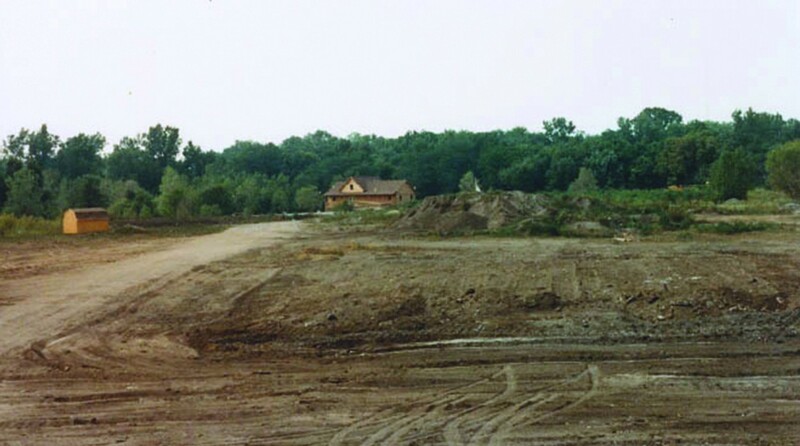 By 1989, the city had agreed to put a thick layer of clay on top of the whole dump area. The technique, called In-Situ Capping (ISC), allows the contaminated area to be secured away from potential leaching rainwater and removes the potential for any major pollutant runoff. With the area isolated and secure, it was time to get to building. Just two years later, work began on two fronts. With significant help from the Martin Foundation and Notre Dame professor Lloyd Ketchum, Gary had the first wetlands built. At the same time, the cabin structure was also born. Over the years, projects continued to expand, as did the grounds themselves. As new projects began, fun treasures were unearthed and turned into more found art. Today, the Center lives and breathes conservation and upcycling in every way. It’s bound to, as it certainly shares some DNA with Gary, it’s father. Remember that hefty chunk of time and talent Gary gave to the Lusher Dump project? 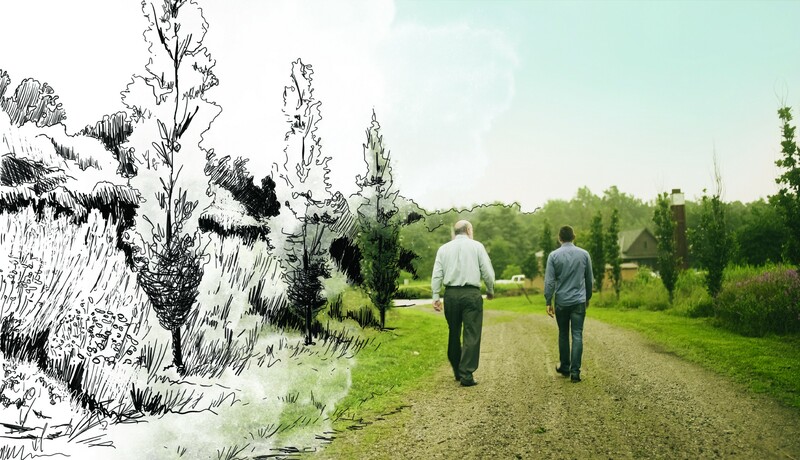 He poured his heart and soul into what became the Elkhart Environmental Center. Through the years, that project has been the beneficiary of grant funds from a number of sources. The Community Foundation of Elkhart County leads among those sources in its effort to make Elkhart a more vibrant community. But time and talent weren’t all Gary had to give. He lived a humble life. He and his wife worked in public service for the bulk of their careers, pouring every bit of sweat equity into making their community great. Gary hadn’t taken days off for headaches or vacations. He had an unwavering sense of loyalty to his community. That’s the reason he won awards as prestigious as the national Public Works Leader of the Year. When it came time for Gary to hang it up (if you know him, you know he never truly will), he was faced with a decision. He had accrued nearly a thousand vacation days. He could cash out, do the sensible thing, and spend the next few years in Bora Bora. Gary didn’t do that. Instead, he cashed out all those days directly into an endowed fund at the Community Foundation of Elkhart County. He used the fund to manage and grow his philanthropic investment, where it not only sees remarkable growth but is also safely in the hands of good community stewards. The Elkhart Environmental Excellence Fund ensures that Gary’s mission at the center and beyond — to improve our local environment — will live in perpetuity. It was his treasure. And he had given it back to the place he called his home, and the wildlife home he had built for his community. As Jamison wraps another successful day at the center, he ushers out a middle school class. His eyes meet a young girl. Her gaze darts from display to display and catches in the sliding glass backdoors. He can see her lose herself for a moment. Gone are the pressures of popularity, of name-brand clothes, of lunch table politics, of lobbying for position in the pecking order. For this moment, the din of youthful chatter fades to the background, and she is face-to-face with nature. He remembers that moment in his own life. He may well have instructed his successor today. It’s a fleeting thought, a half-joke in his mind, but the idea is romantic to him. Despite his youth, he’ll be happy to pass the torch one day, and he might just be lucky enough to have helped spur that person to action. As the girl walks out of the glorious cabin, she’s met with crisper air and a brighter sky. Like Thoreau in Walden, she transcends. She, in that moment, runneth over with potential energy. Like Gary and Jamison before her, she is conjuring up loosely formed dreams. And like them both, she will nurture them and continue to bring life to Elkhart County.